Loved ones broke down as they went to identify the bodies of victims at Chiromo mortuary. Anti Terror Police Unit has been combing out areas believed to be terrorists hideouts and spending sleepless nights piecing up events to net all those involved in the Riverside attack. Shocking details emerged in court on Wednesday as six more suspects were arraigned in connection to the January 15, 2019 terror attack at 14 Riverside in Nairobi. 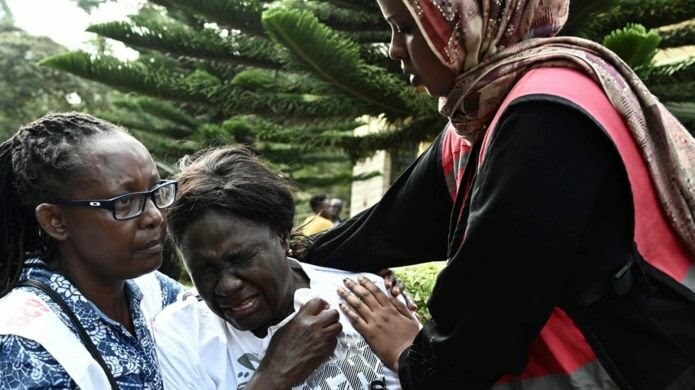 The six; Hassan Abdi Nur, Ismael Sadiq Abitham, Ali Khamisi Ali, Abdinoor Maalim Ismail, Abdullahi Mohamed Hassan and Sophia Njoki Mbogo, were accused of financing the attack that left 21 dead. Another suspect, Hassan Abdi Nur, was said have been receiving huge amounts of money from South Africa, which was later withdrawn through a specific till number. Intelligence reports indicated that he would later send the money to Somalia after making several calls. Abdi, who operates an M-Pesa business, is said to have registered 52 accounts out of which 47 were listed in October, November and December last year. The affidavit reads that Abdi received Sh9 million from South Africa and the same was withdrawn through M-Pesa and later through Diamond Trust Bank Eastleigh Branch. Police suspect the money was for financing terrorism. Abdi is said to have registered 47 Sim Cards using different identity cards and names. The Sim Cards were all used in two handsets which were all geo-located within Eastleigh area, Nairobi. According to investigators, DTB’s Eastleigh branch was used to transact huge amount of money from the suspects and this went without sounding an alarm to the authorities. The bank in this lime helped the terrorists launder their money. Banks have become under criticism for failing to flag suspicious transactions which as its evident, used in financing slaughtering of innocent Kenyans and also the fact that money laundering had been giving corruption in Kenya a leeway. Family Bank Limited has been cleared in the Sh1.6 billion National Youth Service money laundering case after reaching a settlement with the Director of Public Prosecution Noordin Haji. According to investigations, Sophia Njoki Mbogo, a branch manager at Diamond Trust Bank in Eastleigh, was arrested on Wednesday. She allegedly withdrew huge chunks of money from the branch despite no report ever being made to the police. If this is to borrow a leaf from previous money laundering cases with NYS banks then the decision to permit such huge transactions without flagging has a long chain link in the hierarchy that need to be followed. This will open other angles. Banks must adhere to anti money laundering standards to help curbing corruption and funding criminal activities such as Al Shabaab. I therefore suggest that investigations should go beyond the Riverside attack transactions to connecting dots and tracking other active and past transactions. DTB should be sanctioned should it be be proven that they knowingly or unknowingly facilitated terrorism attack in Kenya by such transactions. Court was also told by ATPU that one of the suspects Abdinoor Maalim Osmail, a graduate of Kenya School of Law currently undergoing pupillage, received Sh100M in the past few months. This money is suspected to have been used in facilitating the Nairobi attack. Horizon TV is also in the spot having its two members of press on the dock; Ismael Sadiq who works with Horizon TV as a social media representative. He was arrested on January 22,2019 within Nairobi County and his mobile phone seized. He is said to have been in constant communication with Gichunge. Police suspect he was involved in laundering money and transacting funds believed to be for the purposes of terrorism. Ali Khamis works as a marketing manager with Horizon TV and was arrested on January 22, 2019 and his mobile phone seized for forensic examination. He is said to have been in constant communication with several phone numbers in Somalia suspected to belong to Al Shabaab members. A law intern transacted about Sh100M from unknown sources in South Africa and allegedly used DTB to launder the money to Somalia for financing terrorism. Another one posed as an Mpesa agent, created 52 Mpesa accounts, 47 of which were created in three months. Now question arises as to how all this passed the intelligence eyes and just how porous is the financial system in Kenya that such suspicious transactions can go unplugged? What measures for instance does Mpesa have in place to curb facilitation of terror? 52 Mpesa accounts, one person under three months and their intelligence couldn’t raise an alarm? We’re living in the reality of Al Shabaab menace and not unless things change, it could just get worse. I don’t have to go back and forth on the down ends of money laundering. Terrorism is as alive as finances are available to fund the evil acts. Al Shabaab have known our financial systems are weak and that with a bribe, one can move millions at a go without being flagged as is the case against DTB before the court. If rules aren’t adhered to then we’re laying a perfect ground for Al Shabaab to move their money in and outside our financial setups, plan and attack Kenya with absolute ease. It’s in this breath that financial institutions like Mpesa, banks must be held accountable, it has to be everyone’s responsibility to protect each other. Its a shame that the manager at DTB and sleeping intelligence out of greed and incompetence respectively, allowed the Al Shabaab to successfully execute their plan. Investigations must therefore be carried out and the banks like DTB and other players caught in the act be subjected to cruel sanctions and more importantly, CBK and relevant authorities need to be ruthless with the implementation of anti money laundering efforts.